When Billy, the mechanical ventriloquist puppet used by John Kramer (aka, Jigsaw), comes riding in on his old-fashioned red tricycle, you know something bad is about to happen! If there’s anything creepier or more sinister than using a puppet to inform the victims of your deadly games about the rules and instructions they have to follow in order to survive, we don’t know what it would be (and frankly, we would prefer not to find out!). So if you’re the mood to play a game this Halloween, become The Jigsaw Killer’s personal little puppet of death by wearing this Saw Movie Billy Mask! 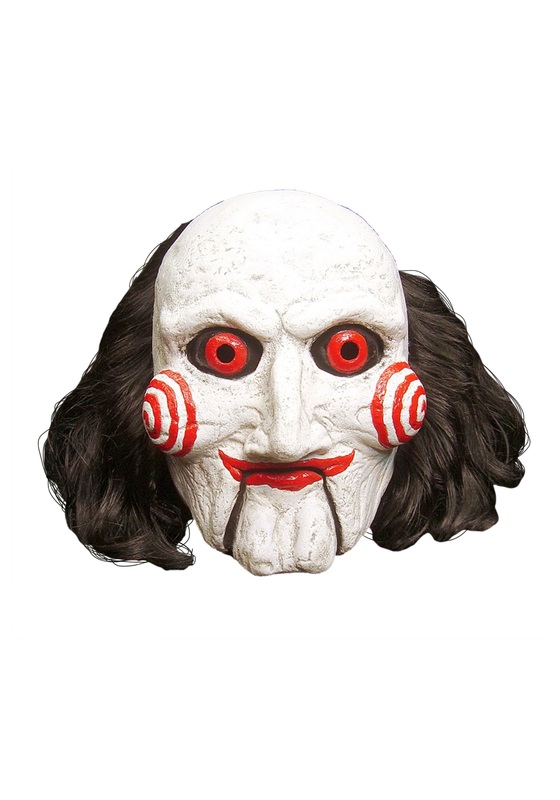 This officially licensed mask covers your face and gives you that sinister evil clown puppet look that will scare the heebie-jeebies out of anything this Halloween! Pair it with Billy’s trademark red bowtie and black and white suit for the full gruesome horror movie effect!